This new model is reportedly 42 per cent thinner than the Sony Tablet S it is replacing, and lighter as well. Photos of one of Sony's next-generation Xperia tablets have been leaked online, showing a device that boasts a number of features and accessories including a keyboard cover/stand just like the one for Microsoft's Surface tablet. A slideshow of the Android tablet was posted by XDA-Developers forum member qsp, who claims to work for Sony. The slideshow was posted on German site Mobiflip. 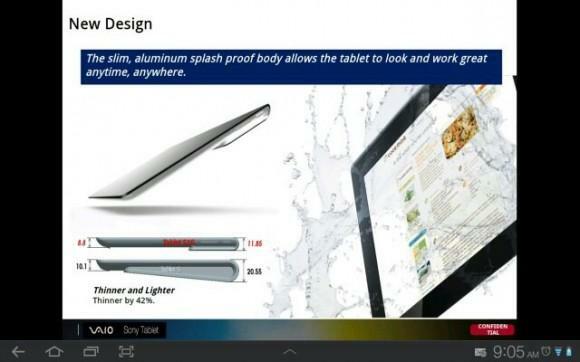 This new model is reportedly 42 percent thinner than the Sony Tablet S it is replacing, and lighter as well. According to the slides, the upcoming tablet will weigh 1.26 pounds (570 grams) vs. the Sony S's 1.33 pounds (595 grams). Instead of a bulky wedge-shaped design, the tablet will have a more understated folded-over bump in the back of its aluminum-magnesium alloy body. The new Xperia tablet is also purported to pack a quad-core Tegra 3 processor, Android 4.0, and a 6,000 mAh battery rated for 10 hours. The resolution on the 9.4-inch screen is 1280 by 800 pixels, which is similar to competing 10.1-inch tablets. Sony's TruBlack display technology is also expected to help minimize glare and boost color vibrancy. The screen also has anti-fingerprint coating and will supposedly be splash-proof. The entertainment-oriented tablet also offers a bunch of connectivity options and accessories. HDMI output, Bluetooth 3.0, SD card, and even 3G connectivity are part of the package. A number of stands and docks, including one with built-in speakers, are showcased in the leaked slides, but it's the slim Microsoft Surface-like one that will turn heads. One really cool feature for families is the Guest Mode, where each tablet user can have a separate home screen, apps, and wallpaper. According to the Sony employee who posted the details, the Xperia tablet will launch in September in three models: $399.99 for the 16GB model, $499.99 for 32GB, and $599.99 for 64GB. However, the slides show suggested retail prices of $50 more for each model (so $449.99/16GB, $549.99/32GB, and $649.99/64GB). Still, these prices are really competitive (especially if 3G is included) and $50 to $100 less than the iPad for each storage option.